The Rotman School is reshaping business education, becoming internationally recognized for advancing the way business schools teach and how business leaders build solutions. To open our doors to innovation even wider, we launched a $200-million campaign in May 2006. The Rotman School is growing. In the past decade, we doubled the size of our MBA and PhD programs and launched a Master of Finance program and new research centres. We continue to grow. In the next few years, enrolment in our MBA and PhD programs will increase by 50 per cent and 30 per cent respectively. 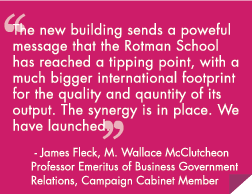 To accommodate this planned growth, the Rotman School is expanding. In 2012, we completed construction of a new building that is fully integrated with and doubles the size of our home at 105 St. George Street. The expansion is the $200-million campaign’s centerpiece and central to our plans to accelerate the development of new tools and frameworks for building wealth and prosperity. The expansion is accommodating a larger compliment of faculty and houses an additional seven classrooms, more than 60 group study spaces, three research facilities, and a PhD centre. We are attracting more of the best academics and ramping up our teaching, research, and outreach activities. This way, students will continue to be taught by the best minds. The business community and policymakers will continue to turn to our thought-leaders to inform public decision making at the highest levels with new, better ideas. To amass a cadre of leading faculty with strong research mandates, more than seventy per cent of our faculty are internationally sourced — one of the highest proportions of any MBA program. The Financial Times, widely recognized as the most authoritative voice on international rankings of MBA programs, places our faculty’s research in the top twenty worldwide and therefore in the company of an elite few academic centres. To recruit more of the world’s best academics, the $200-million campaign is investing in additional Chairs and Professorships, funds used to recruit or retain top-producing academics. 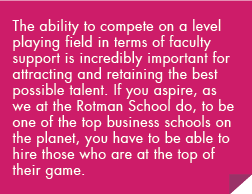 The Rotman School competes globally for the most talented students. The best prospects are drawn to programs that offer significant merit-based scholarships, which not only make education more affordable but promote excellence. Top-performing students raise the bar for their peers by enhancing the work ethic and sense of determination for all students, making scholarships a catalyst for superior class performance. Currently, 15 per cent of incoming full- and part-time students who enrol in the MBA and MFin programs receive merit-based awards. Given that our student population will grow significantly in the next few years, attracting support for more awards and other forms of student aid is a key campaign priority. This essential financial support is making it possible for more young talent to pursue their career of choice and give back to their community.